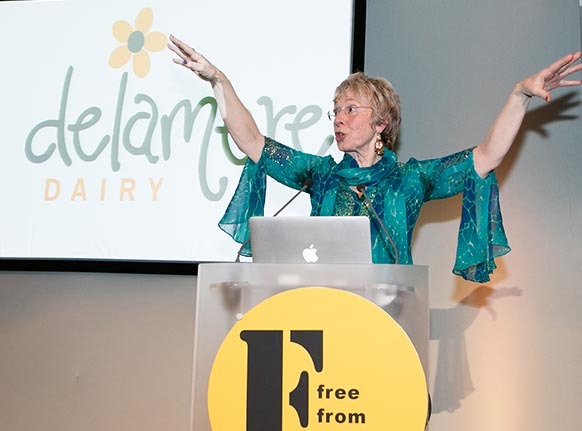 The FreeFrom Food Awards 2016 – the party – and the future!!!! Oh yes – the paparazzi were out in force – including Simeon (or was it Isaac) Bailey, judges in the children’s category, who had come to the party with their Mum, Christine who organises the children’s judging for us. 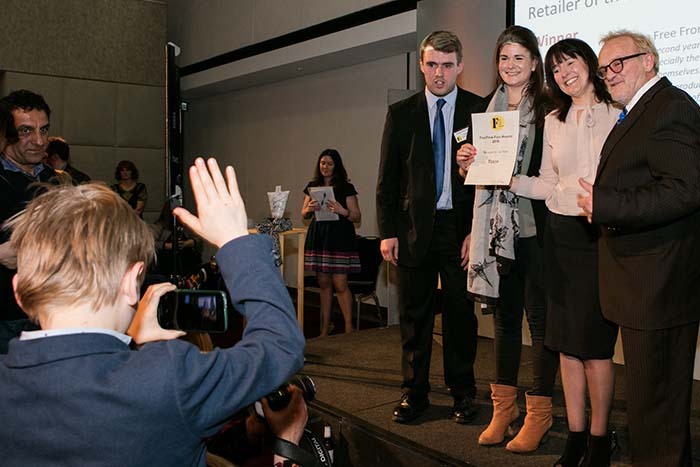 Here he is snapping Tesco (Fiona Carter and Nicki Clowes) receiving their Retailer of the Year Award from Antony Worrall Thompson and Luke Attwell of sponsors, Oakland International. And Simeon and Isaac were not the only junior freefrom-ers to come to the party this year! We also had our diarists, Galaxy Glazer and Marvin the Paranoid Android – Marvin a wheelchair with a broken leg! Not that that stopped any of them testing out all of the excellent freefrom goodies – and racing around the RCP’s many useful pillars!! 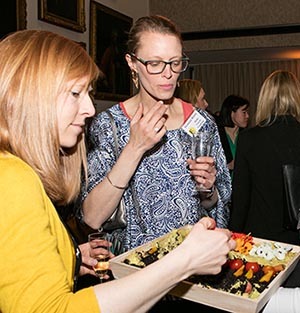 Indeed the Royal College of Physicians was all but bursting at the seams on Tuesday night as just under 300 guests squeezed in for the presentation – not to mention the winners’ buffet and the free gluten-free beer bar. The winners (and commendeds and highly commendeds) are all to be found on the awards site right here – FAR too many of them to mention them all here. 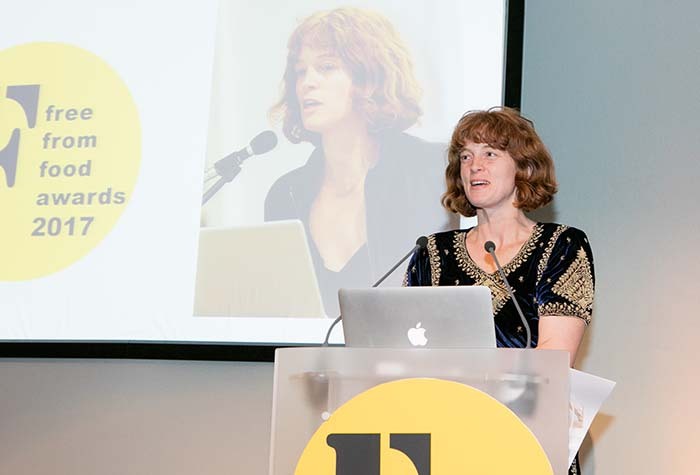 (If you are really keen, you could actually watch the whole presentation – see the second video on the home page of the awards site here.) So just to pick out a few highlights, starting with our Marble Mo winner, Nutribix. 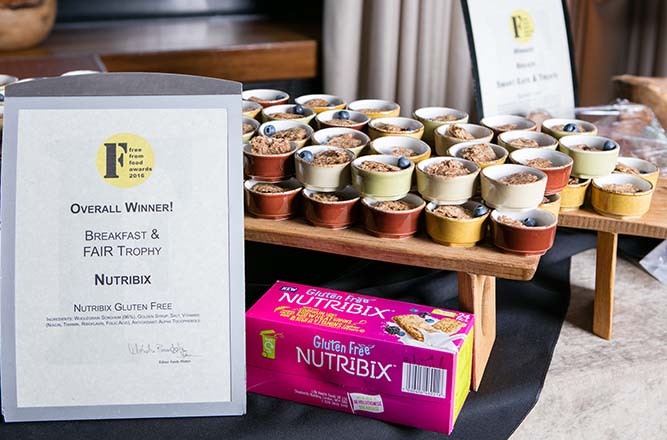 Nutribix, which hails from Australia, courtesy of Richard Keir and Richard George of Life Health Foods, has been greeted with cries of delights on the gluten-free social media scene over the last few months. Why? Because it is a totally gluten free (and all 13 other allergens free) Weetabix look-a-like made from super nutritional sorghum. Purely personally, I could never see the attraction of Weetabix, so I also rather fail to see the attraction (beyond its freefrom and nutritional virtues) of Nutribix. But I am obviously in a unappreciative minority as our judges raved about it! 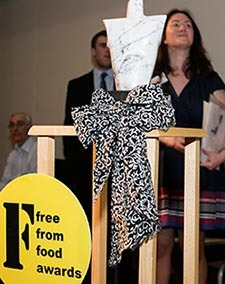 Anyhow, the Richards were surprised and delighted, as you can see, when they were first up winners of the Breakfast category – and positively gob-smacked when they found themselves carrying home Marble Mo!! 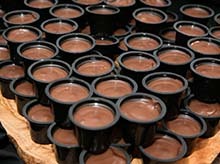 Also of note was the Coconut Collaborative’s win of the Puddings and Desserts category with their delicious little Chocolate Ganache pots which were seriously yummy – just because they have never entered the awards without winning a category! Indeed, in 2013, as Bessant and Drury, they were Marble Mo winners. 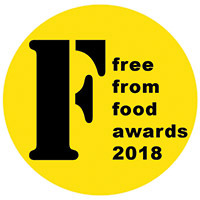 We were also delighted that BoojaBooja, whose dairy-free truffles and ice creams have a beacon of gastronomic delight for milk allergy sufferers for many years, but for some unknown reason have never won a freefrom award (although they have won truckloads of other awards), were the winners of the Confectionery category. 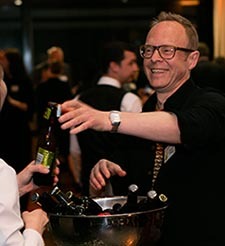 And here is BoojaBooja founder, Colin Mace, celebrating with some of that excellent gluten-free beer! 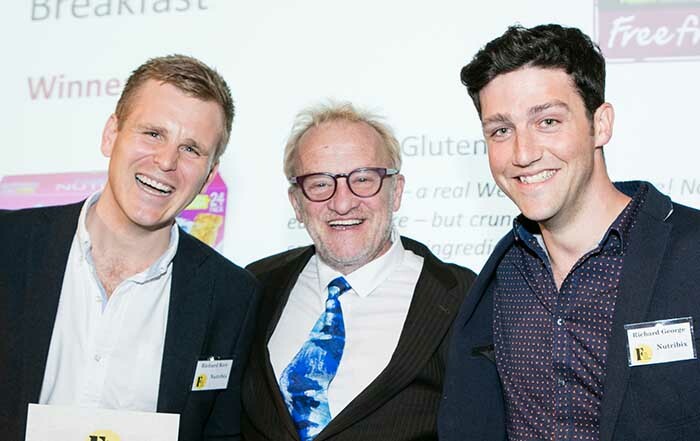 And just to mention one more…… We were also very happy that, as long term supporters of the awards, Mrs Crimbles’ gluten-free cheese straws were joint winners of the ‘Down the Pub’ category with Daura’s delicious double malted lager. 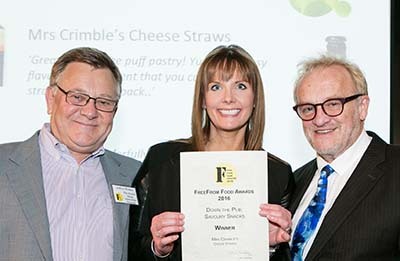 Here is Claire Ramsay of Mrs Crimbles looking very happy indeed to collect her award from Antony and Jeffrey Hyman of sponsors, the FDIN . Right – no more winners as you can find them all on the site…. But, what else do I need to report on? Chef Dean at the Royal College surpassed himself with the most amazing selection of canapés which were not only totally delicious, but were free of all 14 allergens apart from mustard!! Here are Hailey Phillips of Allergy Adventures and Susanna Booth of Wide Circle Cooking testing them out. And then of course the beers… A particularly fine collection this year headed up by that winning Daura Marzen. 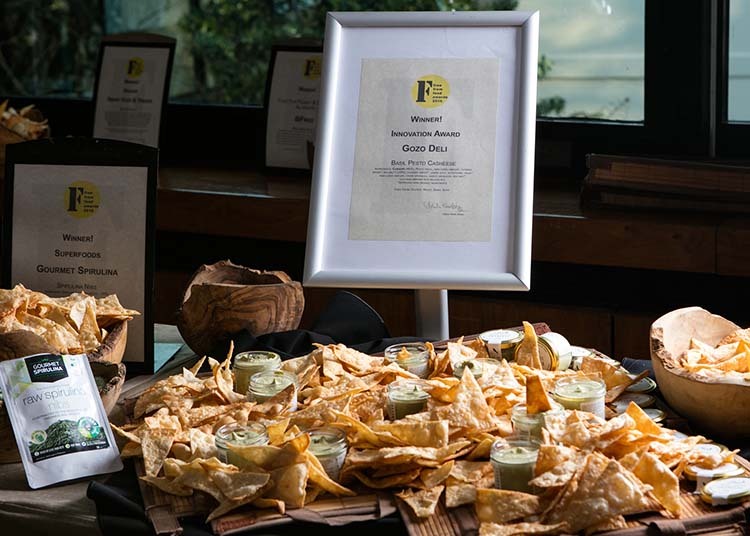 And then the winners’ buffet… Not just exciting to find out what the winning products actually tasted like but all looking to fabulous, thanks so the efforts of Chef Dean and his staff. I am glad to say that Alex did manage to descend from his tweeting eyrie on the balcony, not only to sample the buffet and the beer, but to mingle and chat. Since the guests included lots of our judges, many of whom are active bloggers, Tweeters and Facebookers, he had plenty of friends to chat to. And indeed, they all seem to have done a fine job as I gather the social media has been going mad since the announcements were made; I think he told me that we had had over 200 new ‘follows’ on Twitter during the course of the evening. 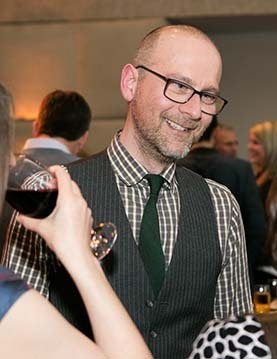 Interestingly, as he says in the lovely blog he has just put up about the evening, this year there seemed to be more non-freefrom folk, health bloggers and media people following the evening’s events and RTing his tweets – which is certainly all good. Meanwhile, up on the podium…..
Well, I spent much of my time shushing the back rows – always the sign of a good party! I am told that I bore a close resemblance to Kate Bush in Wuthering Heights – I have to say that I felt more like Miss Prism attempting to bring the Upper Fourth to order!! First, she was flagging our new category for next year, ‘No Top 14’. This will be awarded to the best product which manages to exclude all of the top 14 allergens. (Gluten/wheat, milk and eggs; peanuts, tree nuts and lupin; sesame, soya and sulphites [over 10mg/kilo]; celery and mustard and fish, molluscs and crustaceans.) This may sound impossible but, in fact, is far from it – indeed we had several products entered this year which already do: BFree breads, Smart Eats and Treats breads, those chocolate ganache pots only need to get rid of their soya lecithin and they should be too – and several more. There is a growing trend to exclude more and more allergens from individual products – a trend that we thoroughly approve of, so thought this would be a good way to encourage it. And…. Next year is our 10th birthday, believe it or not. So we have two tenth birthday projects. 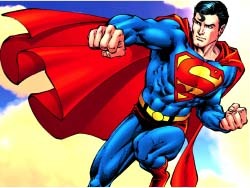 One is to find a FreeFrom Superhero! The person or organisation who has done the most to drive freefrom forward over the last ten years. We are looking for nominations from now onwards (so, if you have any ideas please send them to Cressida right now) and we will put your suggestions to our judges next February to choose the winner. 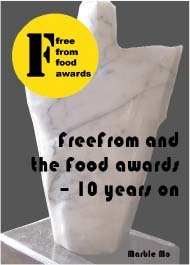 Anyhow, this will be an anniversary book with articles about the winners over the 10 years, our major sponsors (many of whom have been with us almost from the start), a little history of freefrom, lists of all the winners and – well we are not quite sure what else just yet but we are working on it!! The idea is that it should not only be a nice thing for all concerned to have, but that anyone who has been involved (and gets a mention!!!) should be able to use it as a marketing and promotion tool for freefrom and for their own business. Anyhow, we will be looking for sponsors for the book so if anyone is interested please get in touch. 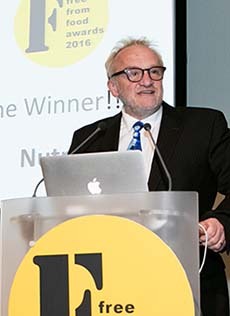 So back to the presentations, made, as always by Antony Worrall Thompson who oversaw the birth of the awards back in his Notting Grill restaurant in 2008. ‘Free from people should not be seen as niche people but normal people – and we need ‘normal’ people to take more of an interest in these ‘niche’ foods to understand that, yes, free from is normal – and often delicious, innovative and versatile too.’ But, he also flagged up yet again that we need this ‘niche’ freefrom food to come more in line price wise. Yes, freefrom food is more expensive to make but we must not let that be an excuse for ridiculous prices. So – another successful awards year comes to an end – and we are already on to 2017. I am delighted to say that before the evening was out at least two sponsors had already signed up again for next year and entrants were already planning their entries for our new No Top 14 category. I am not quite sure therefore, what I was looking quite so dubious about when I was caught by photographer Giles here with judge, Grace Cheetham – and it certainly was not that glass of Fentiman’s ginger beer which, after an hour and quarter of talking, tasted like the nectar of the gods!!! To see all the other pics of the party, click here. 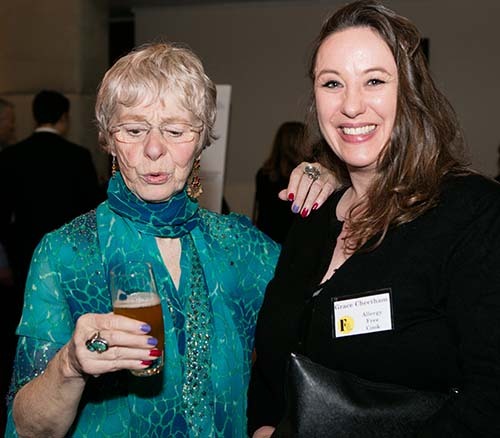 For lots of great blogs about the awards see our press list here, especially the blog from gluten free b about the whole business of jading and awarding. Both Cressida and I got lots of lovely compliments on our awards outfits so, for those who are interested…..
Cressida’s stunningly embroidered, Indian influence, navy blue velvet number came from one of her favourite second hand shops in a back street in Tetbury. My peacock sequins came courtesy of EBay via Katherine with a ‘K’ who, apart from being an expert freefrom cook, has a degree in Fashion Communications and Promotion from St Martin’s. She decided last year that she should take me in hand – and did so. I have to say that the peacock number had been designed for someone a good deal slighter than me, but that did not daunt her and somehow she persuaded it to grow to fit! Peel off nail varnish (which caused considerable stress prior to the event by peeling off every time I tried to attach freefrom awards roundels to stands with sellotape) courtesy of Miss Nella, positively our best find at last year’s Liverpool Allergy Show! !